It’s hard to believe that summer is almost over! School starts up in just a few short weeks. One of my favourite sites to visit during the school year is “Teachers Pay Teachers”. This is my go-to place to find resources and inspiration to supplement my children’s learning. There are many free and low-cost resources to search through. The KNA Shop is offering a FREE set of practice worksheets. 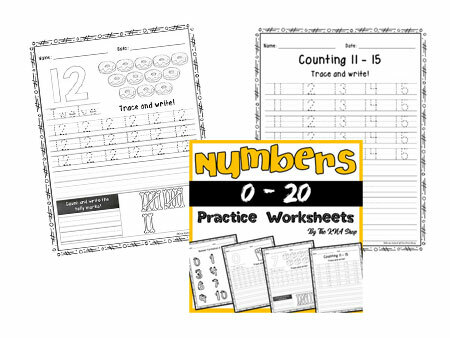 The set of sheets walks your little learner through numbers 0 through 20. The first page takes you through the number formation. This is an amazing addition to any worksheet bundle. Being a “lefty” in a right-handed world has been a struggle, especially when my children were learning to write. It guides the learner through numbers and arrows, on how to properly write the numbers. It’s a wonderful reference for children learning to write. I struggled a little with the number formation sheet. Perhaps it’s because I’m left-handed. I was taught to create the number 7 in a single stroke, where this sheet shows it done in two strokes if I am understanding it correctly. Also the diagram for the number 8 is a little difficult to follow. This can be overcome by sitting with your little learner and working through the sheet together. The worksheets from 0 through 20 all follow the same format. It starts with a “Bubble Number” that your little learner can colour, followed by an image to illustrate the concept of “how many”. Each page shows your child how to spell the number as well. The next five lines are “Trace and Write”. This gives your child ample space to practice writing the number. I love how the creator has used the writing lines to help guide the height, width and length of each number. Finally your little learner is instructed to count and write the tally marks, which reinforces what has been learned while working on the worksheet. There are “Trace and Write” worksheets, 0-5, 6-10. 11-15, 16-20 and 1-20. I like how these are broken down. It gives your learner the opportunity to practice without feeling overwhelmed. Again the KNA Shop has used the writing lines to help guide the height, width and length of each number. Each sheet is done in Black and White which makes it excellent for printing. Only the cover page contains colour. The top of each page contains the Name and Date. Last year my son’s teacher would send homework home the beginning of each week. I would use this Date field to put in the due date of each sheet, making it easier for parents to know what assignments are due. Overall KNA shops have created a fantastic resource to help little ones learn to write and understand their numbers. Check out this FREE resource yourself in the KNA shop on TeachersPayTeachers.com.